Legend has it that today is Krishna’s birthday. The day he visits all houses and leaves baby footprints behind. In the past, Murukkus, Seedai and other goodies used to be made at home. Nowadays, it’s usually home delivery from Adyar Ananda Bhavan or Grand Sweets. Now, being generally irreligious and all, Gokulaashtami (called Janmaashatmi in the North) used to interest me only from the Murukkus and Seedais perspective, but Krishna is overall a very interesting god (Note the lack of capitals). It is not often that cowboys born on the banks of the Yamuna score 16,004 chicks and then go on to speak profound wisdom on the battlefield to a certain confused Paandava. In Chennai terms, Krishna epitomized Jalsa. No Jilpa though. The man generally knew what he was talking about. So this year, it being a holiday, I decided to get involved in this a bit further. 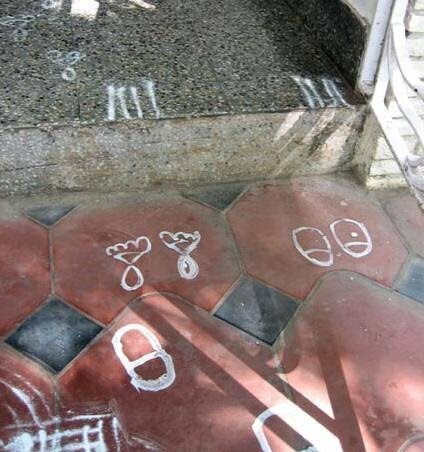 My wife and me volunteered to draw the baby footprints from the gate to the pooja room. Me: So what’s the normal way of drawing these footprints? Me: Wouldn’t a contemporary Krishna wear footwear of some kind? All of us do. Mother: But not inside the house, do we? My youngest brother: Ok. So we draw baby shoeprints till the entrance of the house, after which we shift to regular footprints. Mother: (in a state of general bemusement and disbelief at our level of interest and involvement) Ok.
My youngest brother: Can we also draw footprints along the wall – Spideykrishna? Me: Since Krishna generally cavorted around with multiple gopikas (Cowgirls), can we draw some extra girl footprints by his side? So yeah. I know. I know. I am missing the whole point. The whole meaning. The whole intent. The whole symbolism. Etc. Etc. But the fact that I got a chance to be part of a tradition and bring my own contemporary twist to it (however pointless) is something good no? For a person who had no interest in this whatsoever, apart from the Murukkus and Seedais, i.e, the very fact that I got involved was interesting. Next year, I am thinking about Car tyre marks by the gate, then footprints from there. No. Perhaps, we should be environment friendly and draw bicycle tyre marks. In case I was abroad, perhaps I could draw footprints from whereever I was to my home on Google Earth. Truth be told, this bit of jalsa from my side didn’t achieve much in the way of my understanding of Gokulaashtami but we had fun, without disrespecting anybody. Update ps: I had a slight feeling that some readers might be offended by this whole shoe business, because people might the find the notion of mixing shoes with festivals rather blasphemous, but I wish to reiterate that no disrespect was meant. Afterall, babies do wear shoes when they go outside. And then, K takes his shoes off (on the right), and then enters the house, using his right foot. Oh crap, you actually drew shoe prints! Can’t believe your mother actually agreed. Psst, can I have some murukkus? Save some for me. I’ll be over later. Ok. Next, Left arm around the wicket. And looks like Lord Krishna cramped his foot into the tiny shoes. Blog nalla dhan irundudhu. But shoe prints ellam over much. If Krishna had a modern identity, he would be emailed at srikrishna@bigfoot.com. I do remember that the baby Krishna is shown in pictures as suffering (enjoying?) from a clear case of foot-in-mouth disease. I would radhar not say more, and retyre now to eat my full gopi! Tooooooooooooooooooooooooooo gooooooooooooooooooooooooood! Am impressed with your punning Rambodoc. @KA: Very funny.. 🙂 Was feeling grumpy all day.. lifted my spirits quite high. Thanks. Nice! Maybe you should start calling it gilmaashtami at your place. Perhaps there is hope for you, after all 🙂 Just keep buying sarees, keep drawing those shoeprints on the floor and keep eating whatever shows up from Grand Sweets. Can’t vouch for Ananda Bhawan, I’m afraid. There is a nicer way to draw footprints. Close your fist, dip it in the rice flour and print on the floor. 5 small dots for the fingers. Looks like a baby’s footprints. And yeah, I liked Krishna Jayanthi for the seedai and murukku too. Great idea. Next year perhaps. Isn’t there a butter+sugar combo that is part of the fare? I remember having mixed feelings towards it. I mean butter+sugar – how can one go wrong? But then I didn’t like it as much as I thought I would. The shoe-prints look like enlarged medicine capsules. They’re *that* symmetrical. Heh. I didn’t even know it was Krishna Jayanthi until I read this post. annae. thaanga mudiyalae annae. looks krishna jumped in for first few steps, then walked it seems. unga jalsa vilayatucku krishna’vayum vittu vaicklae. vinayagar chaturthi, saraswathi pooja ellam ini pavam. enna koothu nadaka pogudho. pattaya kelapunga. But when I was in India, my mother had me do the footprints and she told me to make my hand into a fist, dip the side of my fist in the wet-flour mixture and then make baby-ish looking footprints. But of course, berserk-ness always ensued and my poor mum had to contend with several palm prints along with the said foot prints as well. I second VBR in telling you that you completed 30-40 overs when your quota was just 10. rombaaa overrr. But next year is probably too early in your household to try the toddler trick. The trick is to stand said toddler in a thambaaLam of maa-kolam batter and for the mother to stand at the destination, clap her hands and go “amma kitte ooodiyaa chellam” and toddler will race off with a delighted giggle into the waiting arms of amma. In the process, cute little footmarks are generated. Rarely works in practice though. When we tried it, my daughter got distracted by a tidbit on the floor, stopped and made a mess of proceedings. awww soundar’s idea sounds lovely although i could see things going very wrong. After mopping up the damage and letting it dry, we salvaged matters by ‘walking’ her to the finish line, with pitstops every few steps to top up(?) the maa on her little feet. BTW, thanks for your comment on my Father’s day post, pa.
Much in the manner of negligent, egotistic, taking-parents-for-granted children the world over, I never thanked appa for this herculean effort. With the passage of years though, and the aid of many fwded mails about telling your parents you love them, this was my stilted, stiff way of saying ‘I love you appa’. Lol too much boss!! You must have a totally cool momma to let you do the shoes thing. I did the kaal marks thing too yesterday. In traditional fashion, the sankey tank mosquitoes bit every available part of my body while I did it. After marathon sessions of making little footprints, and after my back nearly broke, I glanced through a Amar Chitra Katha’s version of Krishna at a pal’s place. Their little lad enjoyed his physical antics and general grossness and wickedness. And I guess that is what is endearing about the figure:Krishna was a child/ man who was clever, ingenious, intelligent and inventive, sexually vibrant, staunch friend, noble enemy and a ruthless warrior. The Gita he propounded is often debated as a text that reinforces the caste order, exhorts violence and places duty over cause. 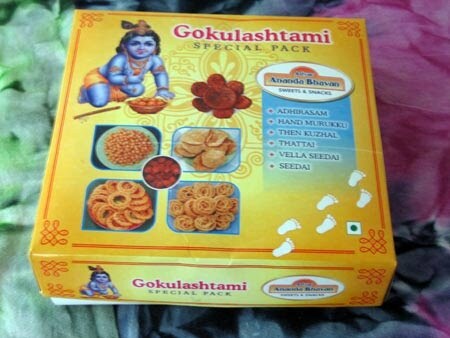 But then Gokulashtami isn’t about quibbles. It’s about fun, shoe prints, foot prints and sweet somethings. hilarious post!!! am suitably surprised that yr mom allowed you to make shoe prints (how nouvel!). and i love this hymn ‘Krishna Nee Begane Baaro’. have been unsuccessfully trying to find the mp3 of this song for aages. btw…it’s a really small world and all that. i discovered that y were my friend’s junior in college in delhi. aahaaa.. eththana peru pa kelambirkeenga ipdi? (other than you and your bro that is)..
btw, Lord K would probably arrive by Apparation (HP lingo, pls to excuse if you no speaketh the sacred word of the JK Rowling world).. but a chariot wheel print would be good too.. antique looks, me thinks.. no big surprise given Lord K did drive around Arjuna during the great big wars of India..
okie, enough paavam doings for this janmam.. please to wear protective eye gear when you sleep, Lord K poking your eye not a very pretty picture, no? No-Comments. Thank God, you dint mention brand mark of shoes on the prints telling that Lord Krishna won’t wear any brandless shoes !! This is a must-do on K jayanthi- play gilli-danda, find a snake & dance atop its head. Snake needn’t be 5-headed tho..
You continue to surprise me with your ever surprising creativity and goofiness(?!). 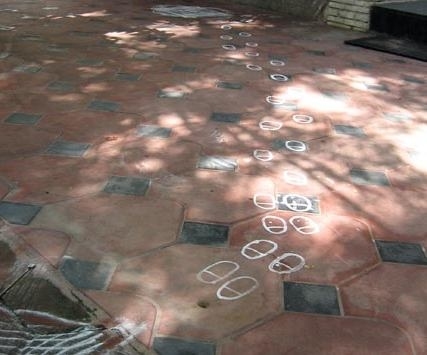 Krishna wearing shoes outside, leaves it outside to step inside your house! And you actually drew it in maavukolam….that is classic Krish Ashok…bravo! Oru nooru peru sollitta, but let me say it again. Remmmmmba overrrr saar! Remmmmba overrr! Love the shoe prints! I see your Baby Krishna has flat feet! I come from a different culture and am loving each and every one of your posts! I had read this post almost a month back and enjoyed it. It never fails to bring on a smile. Very ingenious. It must be very interesting in your household with these kind of ideas floating around. Just wanted to share this with you. Thanks!